Who the heck was this Schoenman character? He was a graduate at Princeton, and studied under Ralph Milliband at the LSE. Ralph spoke very highly of him. 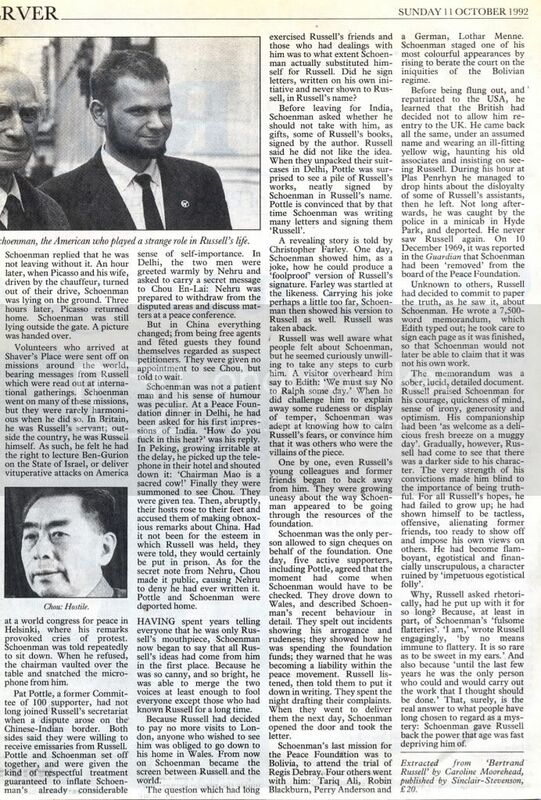 According to Ralph Milliband, it was really him and Schoenman that conceived of the idea of a Vietnam War Crimes Tribunal, to try the US military. I guess it was nothing to do with Russell, or Sartre, or Simone de Beauvoir, after all. Somehow, he got to be made director general of the tribunal, although the article states intriguingly that he was given the position "because it was thought that this was what Russell wanted; only after Russell's death did his wife Edith reveal that far from being pleased, he was appalled." Did Schoenman lie to others about what Russell's wishes were in this matter? It seems he was very manipulative and rather good at lying, and forging signatures, not to mention embezzlement. Also; "He never speaks about his life in politics, He has given virtually no interviews, written no articles; he does not reply to letters." What an unusual and interesting and secretive fellow. 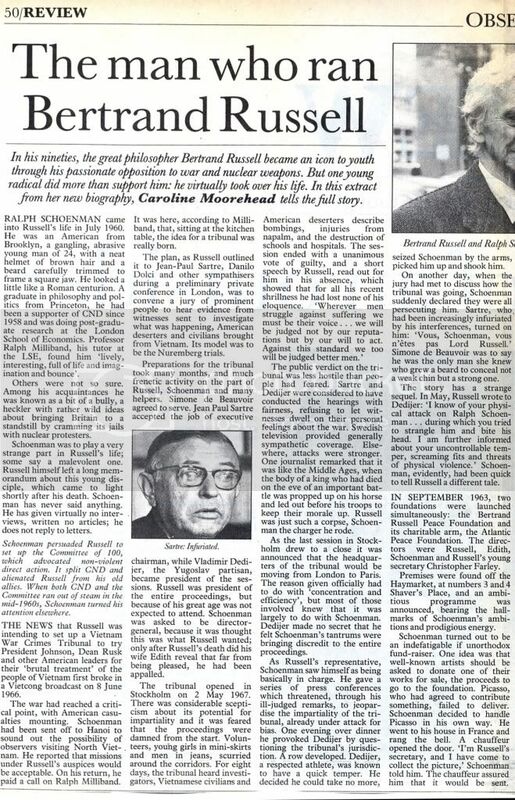 It seems he split CND, and undermined the Vietnam War Crimes Tribunal, as well as other aspects of Russell's peace work. I think it's all more than a little bit spooky, don't you? Interesting that the name Ralph Milliband keeps popping up too, but then what do you expect from the LSE? That's the "marxist" Milliband who said the Labour party would inevitably betray the working classes. And, as the joke goes, had two sons to prove it. Interesting. I wonder if he had anything to do with Russells' memorandum on JFK? Think he's still around. I've met him on a couple of occasions, as I'm sure have several frequent posters here, when he was making the rounds on the 9/11 truth circuit in the earlier days (he spoke in Toronto in 2004, and also in Chicago in 2006). I was one of the organizers of the Chicago conference. Interestingly, I don't think he was a scheduled speaker, but during the conference he made an appeal to the organizers to speak in memoriam of Sherman Skolnick, who had died recently. We let him. From the extremely limited interactions I've had with him, I would largely agree with the characterization of Schoenman's personality presented in this piece. If his speeches are any indication, he may never have fully 'grown up'. I have to say, though: I was extremely impressed with his speaking ability and passion, not to mention his command of subjects pertaining to American imperialism, even though one could see that he was clearly prone to exaggeration and misrepresentation. I remember him giving me a business card with contact information on it, which I think pertained to his work in labor organizing. I could look for it if your interesting in contacting him. I am writing this memorandum concerning Ralph Schoenman, not necessarily for publication, but for reference in case any of my actions in relation to him should be called into question by him or, possibly, by his friends or by anyone else. In part, I am writing it for my own satisfaction since I have been told that he “has it in writing that I am senile”—the implication being that whatever I now do or say in regard to him is said or done, in reality, by someone else using my name. This is not true. My relations to him have been mine from our first meeting when he came to see me at Plas Penrhyn towards the end of July, 1960, to the time of my letter breaking off relations dated 19 July, 1969. My general analysis of his character is given on page 109ff. of the Allen and Unwin edition of the third volume of my autobiography. In it I tried to give my first impressions of him, both pro and con, and to indicate what I later discovered. In the first draft of this analysis I was somewhat more adversely outspoken than in the published version, which I toned down partly to avoid both the possibility of libel and the difficulties of recriminations and long-winded “evidence” and “defence”, and partly because I did not wish to injure him in any way or his position in working for causes that seem to me to be just. I had said in the first draft that I found him “surprisingly unlicked”. I found him not only impetuous but “aggressive and entirely undisciplined and I realised that these characteristics might well make him seem a ‘dangerous young man’”, as I had been warned that he was, “to anyone of whom he did not approve.” I early recognized his lively instinct for self-dramatization, his swash-buckling assumption of the importance of his own role in the centre of the stage. His conviction of his unshakable belief in the penetration and breadth of his understanding were obvious. I did not for some time, however, grasp the closely related characteristic of his utter incapability of imparting reliable information. His reports of people’s reactions and his observations were—and unfortunately, I fear, still are—very often excessively and misleadingly incorrect and his quotations must always be verified. I was impressed by his courage, both moral and physical, although it too often flouted necessary caution and resulted in unnecessary provocation. And I was impressed by his generosity in helping anyone of whom he thought well or thought to be suffering injustice, although it often led to useless waste of effort and money, both of which might have been far more advantageously spent. Were I to list his kindnesses to me, the list would be very long and would include many generous deeds that must have cost him dear in worry and work. I found the quickness of his mind, although it made for considerable superficiality and glibness, immensely refreshing as I did his sense of fun and absurdity and irony, although this often created difficulty, unrestrained as it was by any sense of decorum. If fact, in a world made up largely of people who act, if at all, only upon second or more thoughts and guard themselves well with subsidiary clauses, his companionship was as welcome as a delicious fall breeze on a muggy day. The drawbacks and faults that I found were, I both hoped and thought, such as would be tempered, even erased, by time and experience. They seemed to me to be the outcome of his prodigious driving energy. I underestimated, because, certainly in the early years of our acquaintance, it was rarely shown in my presence, the extreme irritability that sometimes accompanies such quick energy. Only after considerable time did I come to appreciate, as I said in the first draft of my autobiography, “the essential intolerance of opposition and the ruthlessness of his rush towards whatever happened to be his immediate objective.” I did not understand in him at first “the ascendancy of the ego over intelligence” which has prevented him from profiting by his experience or his recognised mistakes. He has not grown up—only grown older and more rigidly confirmed in all his characteristics. He has amassed a great deal of experience, but it remains the same. I have had occasion to call his attention to this fact increasingly often. He himself sometimes alluded to it in deference to my criticisms. To the admirable obverse of Ralph’s characteristics there is always the reverse to be feared. His optimism, for instance, is invaluable. It permits him to see the practicability of ideas that anyone less hopeful would not even attempt to carry out and to inspire others to work for these ideas. His persistent determination to justify his optimism supports him through set-backs that would discourage most people. But these qualities, so admirable in some respects, are disastrous in other ways. They are in large part responsible for his marked tendency to act as if gestures of support and half-hearted promises of financial help are firm promises which will be confirmed and to count upon them as if they were already confirmed. They are also in large part responsible for his firm belief that if he but tries long and hard enough he can extract support from even the most reluctant target. This, in turn, led to his prolonging the many travels and visits that he made on my behalf or on that of the Foundation to twice, or much more, the length that they had been planned to take. And, in its turn, this extension of his term of absence from my or the Foundation’s daily work has left his colleagues to carry on activities that he began but of which he had not fully informed them because he expected to return in time to deal with them himself. Moreover, as he moved about with speed and often with no prior notification to his colleagues, it was impossible to obtain information from him quickly, if at all. As his journeys became more and more frequent during the years that he was working for the Foundation he became more and more difficult to work with. And the fact that “promises” and “important things” that he was accomplishing so seldom bore observable fruit, tended to bewilder and dismay and ultimately discourage his colleagues. Linked to, and perhaps causing, this failure to bring promises and schemes to fruition is his failure to retain the respect or liking of most of those with whom he has had any sort of protracted relationship. He has drawn many people into the work of the Foundation. He has inspired many others, some of them of public distinction, to see the work of the Foundation, as I do, as potentially important to the world. But those who have been drawn in gradually drop out or, because they are led to emulate his extravagances, have had to be sacked. Often after several meetings with those who at first were ready to help us he has lost their sympathy by his importunities and exaggerations, arrogance and bad manners. His self-assurance, which enabled him to carry through actions that would have been impossible without it, also permitted disastrous displays of tactlessness and offensive importunities. These displays were increased by the limelight shed upon our part in the Cuban affair. It inflated his ego more than I at the time realized. When, for instance, he went to China on my behalf at the end of 1962, or the beginning of 1963, he took it upon himself to teach the Chinese whom he met the folly, as he considered it, of the moralities and customs inculcated by their Government. At the first interview given to him and his companion by Premier Chou En lai they were received most courteously and the Premier was friendly and helpful. At their second interview, they were received coldly and severely chided for their behaviour and tactless indiscretions while in China. As their sponsor, naturally, I was rendered suspect. To my distress and to the grave embarrassment of our work, I have never been able to recover the warmth and friendliness formerly accorded me by the Chinese Government. On the other hand, it was necessary to balance against Ralph’s infamous folly in China the fact that he had gone there bearing a message from Nehru which might have provided a way out of the entanglements of the Sino-Indian Border Dispute. Against great odds, he and his companion had managed to reach Nehru and obtain this message from him. And they had also obtained the backing of Mme. Bandaranaike, then Prime Minister of Ceylon. No-one else, I believe, would have done this. No-one else would have believed in the possibility of doing it or had the persistence and hardihood to achieve it. It provides an obvious example of the dichotomy of Ralph’s work, admirable up to a point, but finally ruined by impetuous egoistical folly. Again, I remember that on one of his visits to Israel for me he was given an interview by the Prime Minister, Ben Gurion. He took it upon himself to lecture the Prime Minister on his and the Israeli government’s shortcomings, a lecture naturally resented by its recipient. He told me of this, as he told me of the Chinese episode, upon his return and I pointed out that I thought he had been greatly at fault. He agreed with me. I optimistically believed that he would not repeat these quite uncalled-for rude provocations. The lack of good manners was obvious both in very important matters such as I have just recounted and in the small daily give and take. Discipline was abhorrent to Ralph and he revolted from it instinctively, whether it was administered from without or was recognisably called for from within. No rudeness to someone of whom he disapproved was flinched from by him. No engagement for a fixed time, whether made with an elderly or a distinguished pundit or one of his friends, could be kept on time. He was unable to restrain himself from taking over the conversation if it seemed to be going as he did not wish. Sometimes this was extremely unfortunate. I remember two occasions in particular when this happened. Once when an old friend, with whom I had worked closely and had had many vehement discussions, came to see me concerning our joint work and disagreed with me, Ralph drew the unhappy impression that I was being brow-beaten and not being treated with due deference. Finally, my friend remarked angrily that he had come to see me and not to see Ralph. In the end, I had to ask Ralph to leave us. On another occasion, Ralph believed that I did not hear correctly what was being said by an American acquaintance. He undertook to reply, himself, to all questions put to me until my acquaintance, like my friend, pointed out that the questions were addressed to me. Both these unwarranted intrusions caused considerable trouble. In spite of my remonstrances, I do not think Ralph ever understood the discourteous stupidities of which he had been guilty. The basis of them was perhaps the amiable one, from my point of view, of a wish to protect me, a wish that sometimes led him into fulsome follies or worse, as it did at the end of my speech at the London School of Economics in February, 1965. The wish sprang, I still think, at least in part from a genuine affection for me, and, possibly, admiration, as did his rather fulsome flatteries. I am by no means immune to flattery. It is so rare as to be sweet in my ears. But, if it is very obvious, it can only be irritating and embarrassing. And his was too often so obvious as to make me feel a fool. At first I thought that this was the result of sincere feeling and of his desire to please me, but later I realized that it was also an indirect way of inflating his own ego. On all occasions he used my reputation and any weight that my name might carry to support his own views. And he had a vastly inflated opinion of my importance. Ralph could not, of course, resist the limelight, even in small and silly ways and even against my expressed wishes. Towards the end of June, 1965, a Lobby against our Government’s support of U.S. policy in Vietnam was held at the House of Commons. Ralph wished me to attend it. I did not want to do so as it seemed to me that my views on the Vietnamese War were very well known and that there were plenty of others who would attend the lobby. Finally, however, I gave way to his pleas on condition that, since it was a very serious occasion, I should go quietly and as one of many. Ralph acceded to this condition. When, however, we reached the House of Commons he produced a large sign that he insisted [on] my being photographed holding. He then proceeded, like a monkey on a stick, to climb all over the motor car in which we had driven up in order to flout the police—I forget now how and why. It was all quite foolish and undignified, and I was ashamed. Again, after his ostracism by the British Government, he appeared here—his last visit—done up in a preposterous “disguise” late one evening. It did not occur to him that in doing so he was exposing me to the charge and penalties of harbouring someone forbidden entry to Britain. He simply could not resist flamboyant showing off. It was after the Cuban crisis that I began to see more clearly than I had done the effect of the reverse side of Ralph’s good qualities. He found himself at that time at the centre of the events in which I took part and have related in my book Unarmed Victory and came to regard himself as having been indispensable to me at the time. Perhaps he was. Perhaps I should never have sent the telegrams that gave Khrushchev an opportunity to send his open letter of withdrawal had it not been for Ralph’s encouragement and work or for the telegram that he sent to Khrushchev for me in the early hours of 26 October, 1962. By well after midnight I had become very tired by the stress of the day. I went to bed after a long discussion with Ralph and after arranging what might be done in various eventualities. I exacted a promise from him that he would wake me if anything further transpired before breakfast. He did not wake me, but woke my wife to obtain her backing in sending a further telegram to Khrushchev, the possibility of which we had discussed. It was sent and, when I woke, I approved of its having been sent. It did not occur to me that Ralph did more than a good secretary should have been expected to do in the circumstances. I did not know until considerably later that he was most indiscreetly and inaccurately putting it about, or perhaps allowing it to be put about, that the correspondence at that time was all initiated and accomplished by him. At first I did not believe this of him, but reports coming in through the years giving chapter and verse concerning this and similar indiscretions have convinced me that he is not to be trusted where his ego is concerned. I am now forced to believe that he has made it incorrectly evident that he or, to a lesser extent, others have been entirely responsible for various writings and statements published by me since our acquaintance began. Whether he has ever claimed to have written Unarmed Victory or not, I do not know. He was out of the country at the time of its writing and, when he returned to London, I asked him to verify and to supply certain facts that I needed. In reply he sent me a long account of the whole affair from his point of view, a book, which he had written. My wife and I spent a day in concentrated search for the few facts that I needed. It was the culmination of his tendency to write full length reports of his impressions instead of the factual notes required of him. Since that egregious performance, he has improved in this respect, in regard to my work at any rate. For my answer to the charge that anyone else, other than I, has written my letters or publications or opened and replied to letters from my correspondents see page 164 of the Allen and Unwin edition of Volume III of my autobiography. Complaints, all couched as jokes, came to me in the early days as often as might be expected from the people upholding our civil disobedience work. Ralph would, they said, try to bully them into doing what he thought right by saying that he was speaking as my secretary and voicing my wishes. This, I gathered, moved them less than he thought it should. Not till the year following the establishment of the Foundation did I receive serious complaints of him save from people who did not in any case like what we were trying to do. Always, when any complaints of him came to my notice, I discussed them with him and more often than not he admitted them, promising reform and thereafter often referring to my criticisms and his determination to defer to them. After the establishment of the Foundation in September, 1963, however, the unfortunate traits of which I have spoken became steadily more marked. I began to receive serious complaints from his colleagues and others who were sympathetic to our work. At the end of January, 1964, two of his colleagues called upon me at Plas Penrhyn to beg me to expel him from his position in the Foundation and as my secretary. They spoke for themselves and three other colleagues. Their charges had three main bases: (1) that Ralph was ruining my reputation by telling people that he was responsible for what purported to be my work; (2) that he was playing fast and loose with funds obtained on the ground that they were to be used for my work for peace; (3) that his attitude was dictatorial and his intolerance of opposition intolerable. For these charges they presented chapter and verse. I asked the two who had come to see me and the other three colleagues to put their charges in writing. They did so, and with their letters gave me some precise knowledge that I had not before possessed. I was grateful to them for troubling to do this. Neither they nor any of Ralph’s other associates in the work had, up to this time, made to me any serious or precise complaints. When asked why not, they all said, in various ways, that the had not wished to distress me. They did not seem to realize that by delaying they had put me into a very false position and one that would inevitably harm our work if and when I tried to extricate myself from it. They had hinted at dissatisfactions, but had never given me any information with which to face Ralph. I could now, and did, tackle Ralph about the matters that they had brought up. He either denied the charges and the evidence for them in toto or explained what the “evidence really sprang from”. In view of his rebuttal of the charges, his promise to reform in one case (the charge of wasting money and energy on ill-planned journeys) and, especially, the fact admitted by all his colleagues, that there was no-one else who could take his place and carry on his work, I did not repudiate him. Moreover, I had strong reasons to doubt the reliability and even the capability of most of the complainers. I now suspect that these “reasons” may have been carefully provided by Ralph himself. The most reliable and capable of Ralph’s colleagues were unwilling at that time to bear the unpleasant consequences of plain speaking, although later they were driven to do so. Their reluctance has done great harm both to me and, what is worse, to our work. Thank you for your letter of 26 July and its enclosure. It was kind of you to write expostulating with me directly about the difficulties at Helsinki. As I was not there, I find it hard to straighten out the conflicting reports which have come to me. The statement that you enclose [which she said in her letter “was the speech which caused a great deal of disturbance”] was a message from me. From all that I can gather I make out that it was not this message but a later speech by Mr. Schoenman that caused the difficulty. At any rate, the final resolution adopted by the Congress seems to me admirable—but not the first that they adopted, after the first meeting. It seems to me just possible that strong, obstructionist methods were needed to make the change between the first and the final resolution possible. If so, I am glad that they were taken, though I am sorry that the Foundation has to bear the burden of the disapproval of some of the delegates. As to whether the same end could have been achieved by another and more acceptable manner, I should think probably it could have been, but I was not there, I repeat, in the heat of conflicting points of view. I am glad that you found the Conference a success from many points of view. From this reply, it may be understood how tangled, apparently prejudiced, and often mistaken, the criticisms were. Those who upheld Ralph’s action were hardly clearer. What I made of it all at the time, the above letter indicates. Moreover, as I have said above, the resolution of which I approved was adopted by the Conference after, and not before, Ralph’s uproar and was probably owing to it. A month later, a woman scientist, who had done very commendable work in Britain for international peace, wrote to my wife criticising Ralph’s actions at the Conference very severely. She had not herself been present and based her remarks upon those of a delegate who did not himself complain to me. All these criticisms I took up with Ralph when he returned. He replied that he had gone to Helsinki not only as my representative but, also, as an appointed delegate in his own right. He said that, apart from reading my message, he had made it clear that he was acting and speaking not as my representative but as himself. He was “convinced”—a favourite word of his—that had he not acted and spoken as he did, the Chinese delegates would have had short shrift. He was convinced that the Conference had been rigged by the Americans against the Chinese. It seemed to me, as I told him, that, even if this were so, he might have achieved his end by restraining his temper and being very much more tactful and quiet. He agreed reluctantly that possibly this was so and that he would try not to commit such impetuous and provocative errors again. A few weeks later, I received a long letter from a friend, who had also been a delegate to Helsinki, describing Ralph’s actions and describing how fantastic and fanatical they had appeared to be and, consequently, how harmful to our work. They destroyed, she said, much goodwill towards it and achieved only an immediate and Pyrrhic victory for Ralph’s point of view. Again I discussed these matters with Ralph, pointing out clearly that, while the end that he had wished to achieve might have been praiseworthy, his methods of achieving it had been altogether deplorable. He countered by saying that no other methods would have been effective. I disagreed. He promised again to be less violent and ill-mannered in future. I received a long letter from this same friend a year later. She had been in London for six weeks, during which time, she said, not fewer than twenty-six people, all of whom were sympathetic to my own work, had remarked on the way in which my “image was being tarnished” and my friends alienated by Ralph’s unfortunately arrogant personality plus attitudes and methods which are all too often open to question, I am told, from the standpoint of ethics.” These people had asked: “What is the hold this man has over Russell? Is Russell now senile and unable to make his own decisions and so is accepting whatever is put before him? How is it Ralph seems to overrule Russell to continue doing the things Russell has personally repudiated?” To my request for specific facts backing up these charges, I received no reply, and they continued to seem quite unreal to me. My sympathies and engagement in your work and the aims of the Foundation are what they always were. I feel as strongly about the war in Vietnam as ever. I think that the Bertrand Russell Peace Foundation—with the extraordinary example of your life and work—could become the most important independent intellectual force in the world today. The reason for my resignation is personal. I feel that Ralph Schoenman has captured the Foundation and turned it into a monolithic expression of his own limited interests and abilities. Before my resignation becomes official, I would strongly urge that an independent group examine Mr. Schoenman’s competence to continue further his sole leadership of the Foundation. I also feel that an independent group of accountants should make a report to the board of directors concerning both income and disbursement over the last three years. Believe me, Lord and Lady Russell, that resigning at this moment is painful. I also find it painful to be unable to conclude the film about you which I have begun. I have notified Schoenman of this on four separate occasions in writing; I believe that the raw materials of the film, as now unedited, is of great value. As of today, Schoenman has not answered any of my letters concerning its disposition. I feel that it is improper for me to continue physical ownership of the negative and film. Will you be kind enough to let me know what should be done with it. I should at that time willingly have consulted accountants and an independent group of individuals as to Ralph’s administration of funds and general competence. But where could I find such a group? As to the matter of the film, Ralph and his colleagues told quite a different story from that told above. We were finding it difficult to extract the film from its maker in spite of many letters to him asking to have it sent to the Foundation. I made clear my belief that it was necessary to have accountants audit the accounts of the Foundation. I have an unusual letter to write, so may I in advance beg your patience and forgiveness. I have been engaged in the activities of the Hempstead C.N.D. and the Camden Committee for Peace in Vietnam during the past two years, and, more recently, Hempstead Labour Party. Inside and outside the committees I have met a great many people holding a great many views, although naturally almost all fall within that part of the spectrum called the Left. I have found however two things that almost everybody has in common, one is a profound respect for you, the other is dislike of Ralph Schoenman. I certainly have no doubts concerning his dedication to your work, it is his public presentation that is in question. I wish I could give you specific examples of what I mean, but this is very difficult. There is a certain conceit, a certain unwarranted hostility towards people that goes ill with his position. My impression of Mr. Schoenman is general, as are the impressions of most people, but such as it is it is a bad one. I would not presume to write to you thus were I alone in this feeling. I am vague on the cause, perhaps I can better illustrate the effect. I have a friend who holds a very responsible position, has a most pleasant disposition, and excellent opinions. I remarked to him on the photograph of you on your verandah in the Observer earlier this year. He agreed with me, an excellent picture, but added that Ralph Schoenman was probably just out of sight propping you up. He was half in jest, but others make similar remarks and are serious. The spite, or cynicism, of such remarks is not directed at you but at Mr. Schoenman. My purpose is to bring to your attention something that I find very disheartening. Had I not met many other people who share my opinion I would not presume to write to you. I must say I intend no harm or calumny to Mr. Schoenman, but knowing how widespread my feeling is I think it has to be of some importance. I hope you will not think me impertinent, for I am sir, with the greatest respect, yours most faithfully. Such generous and obviously sincere criticisms as the foregoing were extremely disturbing and carried entire conviction. But it was quite impossible to make Ralph understand them. His reply was to the effect that anyone who worked with energy for the ends that I desired would be more than likely to incur such criticism. And it seemed to me that there was a great deal of truth in this reply. I could only beg Ralph to be gentler and more tolerant in his presentation of our views and beliefs. As I watched the development of the War Crimes Tribunal in 1967 doubt became even stronger in my mind. Ralph was appointed Secretary General of this Tribunal. I watched his doings with greater objectivity than I had been able to do formerly since he was acting, not as my secretary or representative, but as an executive of an organization which I entirely supported though in the running of which I took no active part. I had been increasingly aware for some time that, though Ralph was invaluable in developing an idea to the point of practicability, he was disastrous to that idea when he attempted, himself, to carry it out. This belief was confirmed by his actions as Secretary General and by the unnecessary quarrels and muddles largely created, I understood, by him. Again, the dichotomy was visible: it is quite possible that the Tribunal would never have got off the ground had it not been for his intense efforts; but had his efforts been accompanied by even a little restraint and considered planning and with less provocation to those who did not approve of his methods or of the Tribunal itself, the latter might have accomplished as great—and it was great—a work as it did with far less cost in human frustration and futile work as well as in money. I felt that his display of egoism and flouting of advice, especially of advice given by his colleagues, at this time and in the following months when he flew about the world, as it seemed to me, heedlessly, rendered him only a liability to the Foundation. But the Foundation had become, in November, 1966, a limited company. The change had my entire approval. The company was administered by directors of whom I was not one. I had no executive position in it. It was, consequently, no part of my business to retain or to dismiss Ralph except as my secretary. And he ceased to be my secretary in 1966. I felt that Ralph should be dismissed from the Foundation. I had for some time insisted that he should not speak either as my secretary or my representative except on such occasions as we had specifically agreed that he should do so. I reiterated this in a letter in 1966. He assured me that he honoured this decision of mine. I constantly, however, heard and read of his having made pronouncements as my secretary or representative. He pointed out that this was not his fault, that, in spite of his denials, others took it for granted that he was still my secretary. Perhaps this was true. In any case, I could do no more than urge him to make it very clear that he was not speaking or acting for me. I felt that I might or might not agree with what he said or did. I wrote to him in 1967 on this subject in categorical terms, such as I had used only in speech theretofore. The directors of the Foundation company were not even yet fully convinced that he could no longer be useful to the work and was harming it. I had frequent discussions with some of them about the matter. They appeared to feel that it would make their position as colleagues of Ralph more difficult were I myself to break with him. They feared also, I learned, that if I did so, he would retaliate in ways that would not only hurt my feelings but would harm my work. I did not know at this time that this was one, and perhaps the chief, of their reasons for their cooler than luke-warm reception to my wish to break with him. Nevertheless, I now think I should have broken with him several years ago. Instead, I temporised. I made a grave tactical mistake: in my desire to put my attitude towards him and my criticisms quite clearly before him and yet in no way harm the efficiency of his work as the directors had made me feel I might do, I agreed with my wife that she should make the criticisms to him in my presence and that I would merely agree with them. It was a foolish plan. Unfortunately, his assurance was such that he took refuge in the belief that my wife was persuading me to oppose and mistrust him. I soon realized that all I was doing by this roundabout method was confirming in him the very characteristics that I most deplored. When, in 1969, I learned of what I had not suspected hitherto, that, consciously or, again, through over-optimism, he was indulging on behalf of the Foundation in what can only be termed dishonest means of accumulating funds for his work, I could no longer continue to support him in any way. He was, without authority, selling the rights of books, refusing to send on funds owing to the Foundation in London, attempting to divert funds payable to it from the sale of my archives, insisting that English tax laws be flouted, and employing other such discreditable means. Perhaps I should have recognized this tendency toward financial unscrupulousness in Ralph earlier, for I had had occasion to remonstrate with him a number of times when it seemed to me that he was sailing very close to the wind. For instance, he arranged with the editor of one journal to pay a certain sum for the right to publish statements and articles by me hitherto unpublished. He then sent these articles and we received the money for them. But he sent them to other journals which occasionally, owing to their dates of appearance, published them before the editor with whom he had made the original contract could get them out. Naturally, this editor was angry. And so was I. I quarreled with Ralph about it, but failed to convince him. At the time I felt that I had to support Ralph. I now believe I was mistaken in this. During the past two years, since he has been forbidden entrance to Britain, he seems to have been attempting to carry out his ideas without reference to the advice and needs of his colleagues in the Foundation. Certainly, he has flouted my criticisms, paying no attention to them save to pronounce them ill-based. His actions have reinforced the confirmation that the War Crimes Tribunal has given to my belief as to where his value lay when he was still valuable. But his actions since 1967 have become so egregious that he appears to me no longer to have any value in carrying on the work that I believe the Foundation to be engaged in and which I think should be done. It is for his colleagues to give the facts of their difficulties in working with him. My own reasons for breaking with him I have tried to make clear in this memorandum and to indicate to a slight degree in my autobiography. I have given them directly to Ralph himself in the past, especially on the few occasions when he has visited me here in the last three or four years. I have referred to them in my last letters to him, copies of which I think are in my files along with other correspondence addressed to me by him and others. I am particularly sorry to have had to make this open breach with Ralph because I fear that it will distress his parents whom I both like and respect—unless, of course, they can take refuge in the belief that I have been persuaded, or even forced, to make it by my wife and the other wicked people who surround me. The question of cardinal importance that has been put to me is why did I not break with him earlier. I did not do so because, until the last few years he was the only person who could and would carry out the work that I thought should be done. The balance of his accomplishments over his drawbacks has only gradually been reversed. His faults and mistakes were of less importance than his ability to turn vision to practicable effect and his courage and optimism in carrying out our ideas. When, sometime after the Cuban debacle, he finally took the bit in his teeth and later careered away unrestrained as Secretary General of the War Crimes Tribunal, I became increasingly doubtful of his usefulness to the work and remonstrated with him both frequently and severely. Since his methods, however, have become importunately open to question and, consequently, intolerable, during the last two years, and during the last year can only be termed dishonest, I have felt it necessary to make a definitive break with him. I did this in my letter to him of July, 1969, to which I received no reply. Towards the end of November, 1969, I was obliged to write again in an endeavour to extract an understanding that he would cease using either my name or my wife’s as he has been doing to support his own work. And in the past few days, I have found it necessary to prepare a public statement of repudiation, since I must, if possible, dissociate myself and my wife from all Ralph’s actions in the minds of all men who will listen. Had I seen the letter which Ralph wrote to two of his co-directors on 29 June, 1968, earlier I would have unhesitatingly broken definitively with him at once. But I was not shown this until late in November, 1969. It is a preposterous document. But in it he presents his point of view on our association at length. It therefore deserves an explanation. In it he objects to what I said of him in my autobiography on the ground that it is “a betrayal of all the years I have devoted to the Foundation and to Bertie, years in which I have worked flat out and at the risk of life for twenty hours a day.” Possibly he is referring to the first draft of my autobiography. I was, and still am unaware of any occasion upon which he risked his life either for my sake of that of the Foundation. If he is referring to his travels in Africa, the dangerous part of those were made without authorization from either me or the Foundation The same is true if he is referring to his second journey to Bolivia when he got himself imprisoned and shot at. In both cases he was begged to return to London or to stay in London as he had been away many weeks longer than had been intended and all the work of the Foundation was held up by efforts to straighten out what he had begun and abandoned. Much of the rest of his letter, three closely typed pages, is a diatribe against my wife who, he states, has been waging a campaign against him. In the course of this he utters nonsense, saying that “she has tried to deny me the help of the Foundation when I have been in prison or in need of assistance to recover my passport. She has manoeuvred to prevent my return to Britain and when I did return she put out a vicious Press statement dissociating Bertie from me which only a miracle prevented the bourgeois press from blowing up into a major scandal.” All this is, of course, untrue. She has often helped Ralph, and would have helped him in prison had there been anything that she could have done for him. She has never put out a Press statement of any sort, vicious or otherwise. Moreover, he says that “she has harassed and bullied and tormented Bertie to secure his acquiescence in her efforts.” I have never been harassed or bullied or tormented by her. The idea is ludicrous. And in point of fact, she felt optimistic about Ralph for a longer time than I did. Ralph thinks that it was she who made me demand that he should not be my secretary. “The muted and scarcely existent public support of Bertie for me when I have been in grave danger and now banned from Britain” is owing to her. And her nefarious actions culminate in “harmful” remarks that I make about him in my autobiography. I have been under the impression that I had helped Ralph as much as I could, and I do not think that I have been ungenerous to him in my autobiography. I should ask Ralph to reflect on his own past speeches concerning the duties of a good secretary. And also upon the number of times that I have urged him to compare the paragraph about my wife on page 5 (Allen and Unwin edition) in the Preface written by himself to the book which he edited entitled Philosopher of the Century. It was first published in 1967. I entirely subscribe to what he says in that paragraph, as does my wife. But I should think that the change that he finds to have taken place in one year, 1967–68, would seem even to Ralph to be unlikely. I suppose that he has invented my wife’s campaign as a face saving device against my criticisms. There is no slightest danger, and never has been, of my being torn apart by conflicts between my wife and Ralph. This letter leaves me with the impression that Ralph must be well established in megalomania. The truth is, I suppose, that I have never taken Ralph as seriously as he liked to think I did. I was fond of him in the early years. But I never looked upon him as a man of parts and weight and much individual importance. DrVolin wrote: Interesting. I wonder if he had anything to do with Russells' memorandum on JFK? After [Clay] Shaw’s arrest, Jim Garrison received from Ralph Schoenman, philosopher Bertrand Russell’s secretary in London, copies of a series of articles published in an Italian newspaper of the independent left called Paesa Sera. The articles had been assigned six months earlier to expose the CIA’s pernicious attempt to influence European electoral politics and to thwart the democratic process in more than one country. They focused on ‘Centro Mondiale Commerciale,’ the world trade center in Rome, as a CIA front, one modeled, according to a 1958 State Department document, on the original CIA-created International Trade Mart in New Orleans. Paese Sera, of course, did not possess this document. Its evidence came first hand. A Farewell to Justice: Jim Garrison, JFK’s Assassination, and the Case that Should Have Changed History. by Joan Mellen. Pgs. 136-140. That is very interesting. Thanks very much for that.